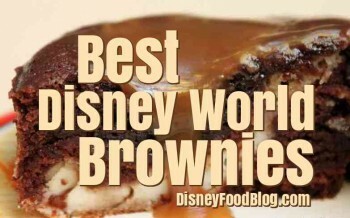 Remember oh those many years ago when I presented you with my Top Five Disney Brownies? 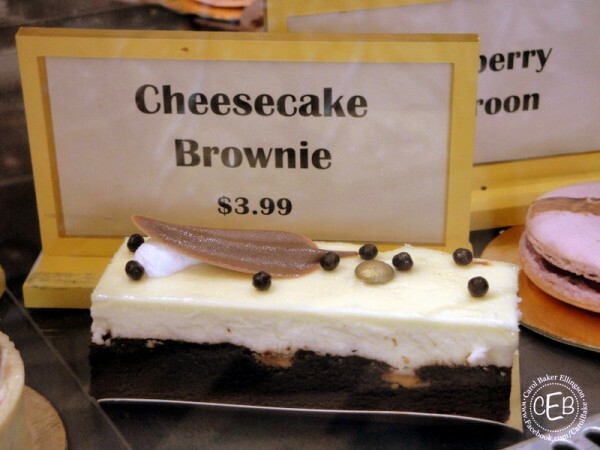 But fret not… there’s still no shortage of classic brownie goodness in Disney World (and some not-so-classic, as you’ll notice many of these feature a twist on tradition). 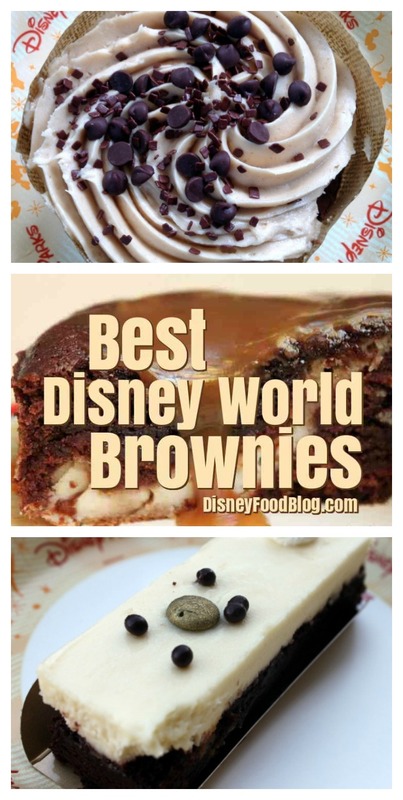 Whaddya say we make a NEW Best Brownies list? That’s right… a new list for a new year! 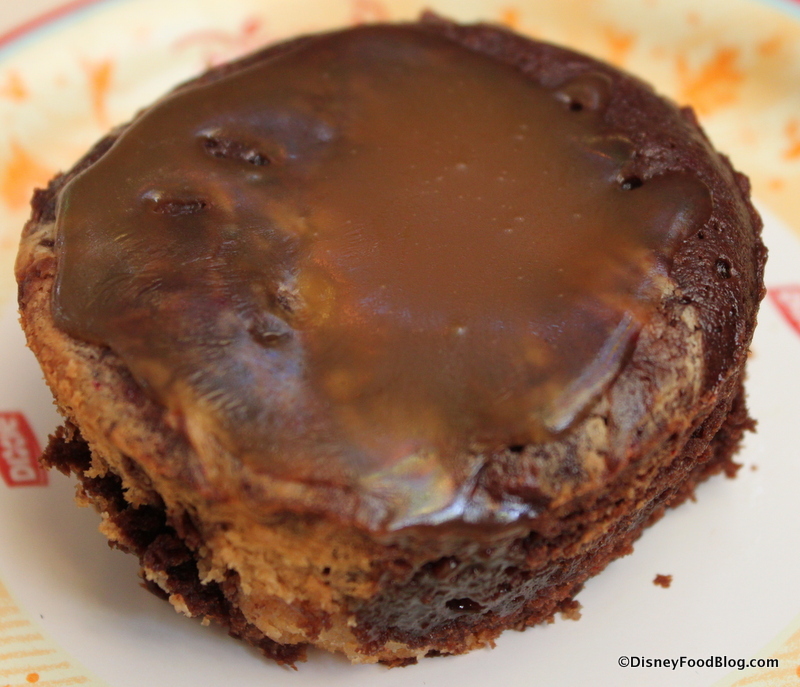 Grab a fork and get ready to dig into some chocolatey brownie deliciousness with me! OK, this is probably the best thing you will put into your mouth all month. Let me say that I eat a lot — A LOT — of Disney food, and much of it is sweet deliciousness; but this thing took my breath away. 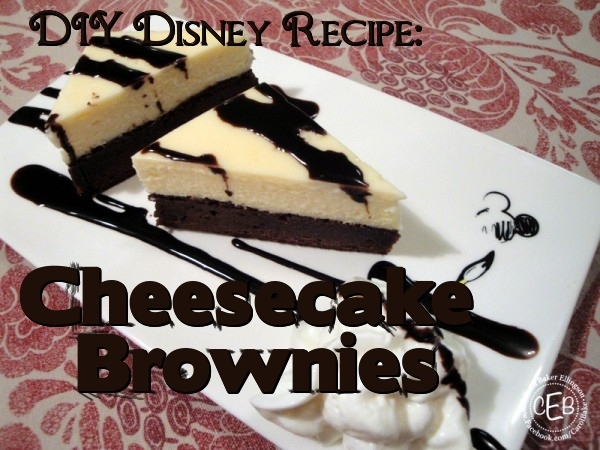 Welcome back guest chef, Carol E.
The Very Famous Cheesecake Brownies from Disney’s Boardwalk Bakery are next up for our DIY Disney Recipe series! 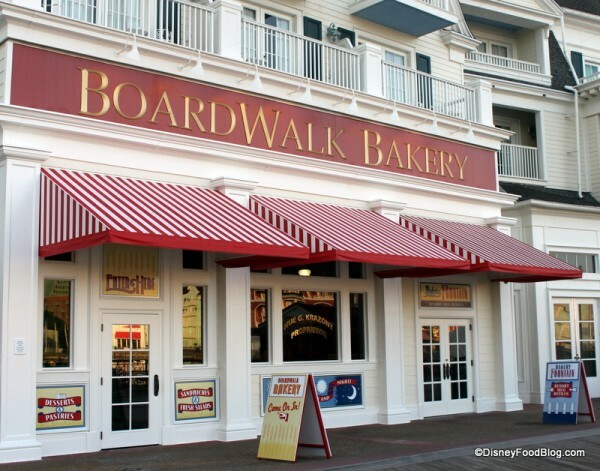 As Disney fans know, the BoardWalk Bakery in Disney World was closed earlier this year for refurbishment. Since we couldn’t have bakery date nights for a while, I was happy to find the recipe for Boardwalk Bakery’s very famous Cheesecake Brownies in the Delicious Disney Desserts cookbook to help get us through! 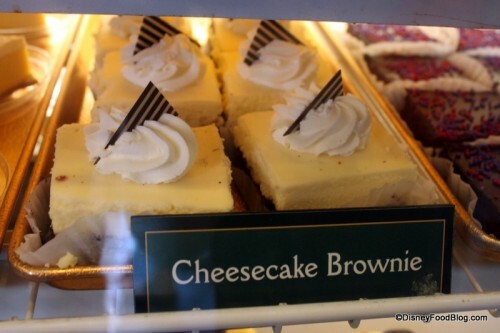 Here’s what the new Cheesecake Brownie looks like now…they made it a tad bit more gourmet! 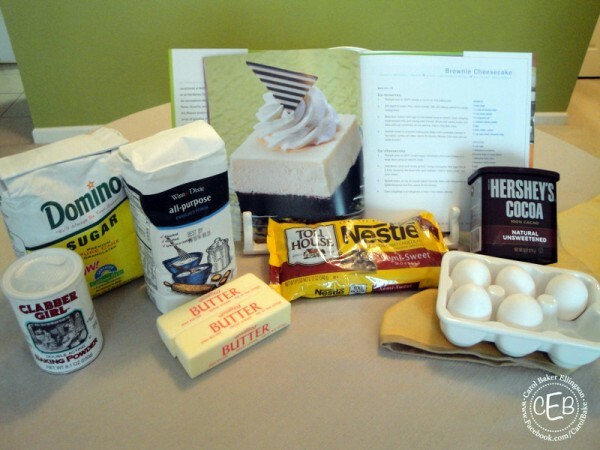 Just a heads up, this recipe is super easy to make, but it is a make ahead recipe. There’s a lot of baking time required and it really needs to sit in the fridge overnight in order to chill down enough to serve! They may not be as fancy as cake or as rich as fudge, but they sure are a great compromise! Brownies are a true comfort food, and Disney has figured out several ways to make them even more special. 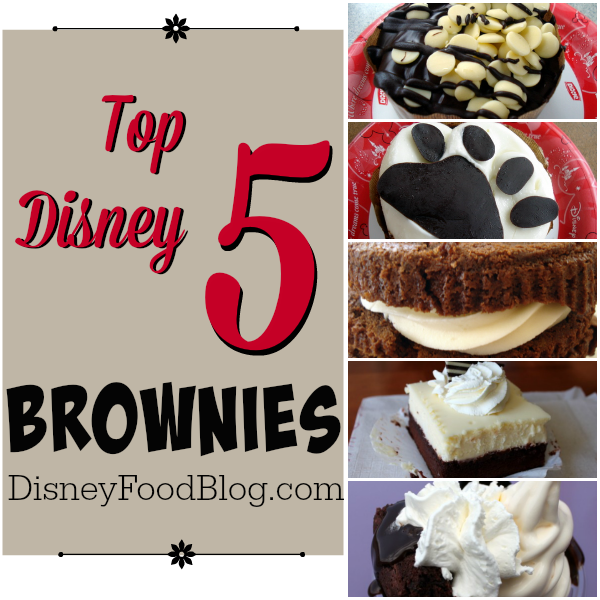 Check out our top five Disney brownies below! 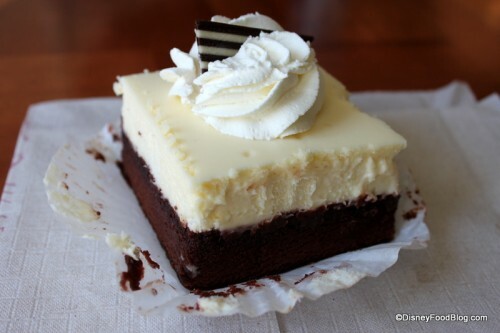 This gorgeous confection is brownie on the bottom and cheesecake on the top. 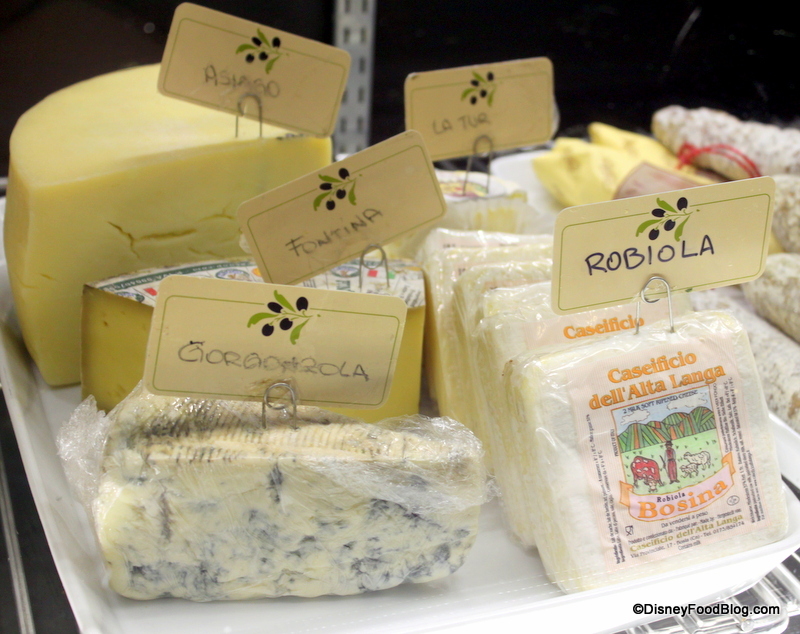 A perfect mixture of “classy” and “comfort!” Find this one at the Boardwalk Bakery in Disney World’s Boardwalk Inn. 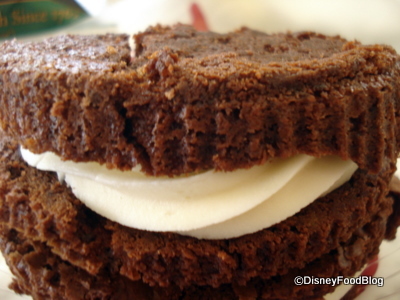 Found at Earl of Sandwich, the brownie-frosting sandwich is pretty true to its name. 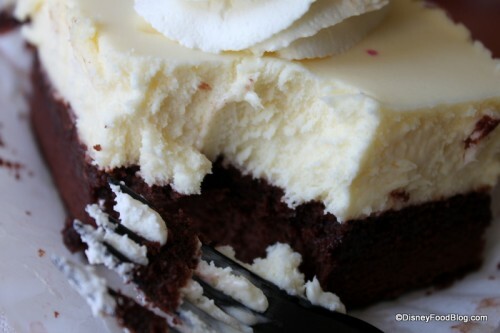 Two of Earl’s incredible, chocolate-chip packed brownies sandwich some incredible buttercream frosting. You’ll definitely need to share this one! We’re gearing up for the 2011 WDW Foodie Fest events, which begin the first week of October — check out our schedule of events here! 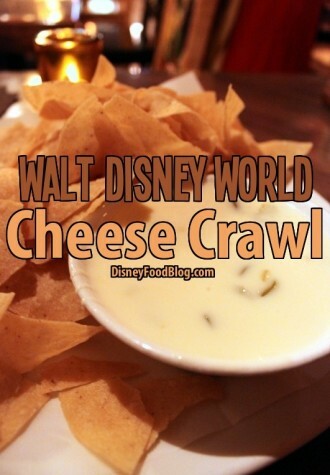 Isn’t Disney food even better when we share it with friends? We designed the WDW Foodie Fest as a party for Disney Food fans as we celebrate the opening days of the 2011 Epcot Food and Wine Festival! 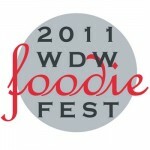 Currently there are four events scheduled during WDW Foodie Fest! Let’s all meet at Ariel’s in Disney’s Beach Club Resort from 11am-1pm. On the same trip to Disney World’s Boardwalk Bakery where I found the (life-altering) peanut butter cupcake, I tried one of the bakery’s famous Cheesecake Brownies for the very first time!! This brownie has been around for quite a while — its recipe is even highlighted in Disney’s Delicious Disney Desserts cookbook — and there’s a reason why this snack/dessert has stood the test of time. The rich, tangy cheesecake taste coupled with that strong, super-sweet dark chocolate brownie offers the perfect marriage of two delicious desserts; but I will say that this snack is both large, and super-rich — it’s ideal for sharing!